During the global justice movement at the end of the 1990s, it was common sense among activists that globalization had bypassed and undermined the state system. Our enemies were not imperialist states but rather multinational corporations and international institutions like the International Monetary Fund (IMF), World Bank, and the World Trade Organization (WTO). The intellectual expression of this common sense took the form of Michael Hardt and Antonio Negri’s Empire, which argued that state-driven imperialism was a thing of the past. The US wars and occupations over the last decade shattered these illusions. In their place, a host of Marxists from David Harvey to Ellen Wood have attempted to craft theories of imperialism capable of explaining today’s world. Leo Panitch and Sam Gindin have been developing their own distinctive theory over the last decade in a series of articles in the Socialist Register, various journals, as well as in their 2004 book Global Capitalism and American Empire. They have now expanded and enriched their argument in The Making of Global Capitalism, which recently won the prestigious Isaac and Tamara Deutscher Memorial Prize. 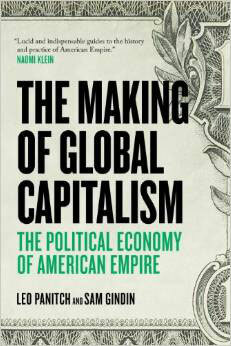 Its reconceptualization of the US empire and globalization is vital for the revolutionary Left to discuss and debate. The book demonstrates how the American state spearheaded globalization and documents the dramatic impact of the neoliberal boom. As this article will argue, however, it underestimates the persistence of geopolitical rivalry between states in the world system today. They pay little attention to US imperialism’s wars and occupations, which they point out has been exhaustively documented by other analysts like Noam Chomsky. Instead, they focus on how state managers, especially in the Treasury Department, created and implemented economic policies to economically integrate the globe. After the Second World War, they argue, the United States set up the basic architecture of the new system at the Bretton Woods Conference where they launched the IMF, World Bank, and the General Agreement on Tariff and Trade, which would become the WTO in 1995. Over the course of the following decades, the United States brought an end to Europe’s formal empires, defeated the Soviet Union in the Cold War, and opened up the economies of the world’s capitalist states. In the process, Panitch and Gindin contend, the United States “internationalized” its state. It not only, in their phrase, “superintends” the reproduction of its own capitalist economy, but that of the world system. It therefore implements policies that are in the interests of its capitalist class and world’s capitalist classes, whom it subsumes under its own mantle. They are careful to distinguish their argument from that made by William Robinson in A Theory of Global Capitalism that a transnational capitalist class is coming into being and is in the process of constructing a global state through international capitalist institutions like the WTO. They note that “‘national capital,’ in the shape of firms with dense historic linkages and distinct characteristics, did not disappear. Nor did competition between various centers of accumulation.” But, they argue, the internationalization of the US state and its central role in reproducing global capitalism prevent such ongoing competition from producing interimperial rivalry. Panitch and Gindin contend that Washington was able to construct its global empire by successfully overcoming the 1970s economic crisis. They claim that this crisis was precipitated by workers’ high wages in the United States and other advanced capitalist states, cutting into profits. In response to this “wage squeeze,” they argue, the US capitalist class and its state turned to neoliberal means to restore their profits. They drove down workers’ wages and benefits, restructured America’s industrial base, pried open Third World economies to globalization, and facilitated the dramatic rise of finance capital as the leading sector of the ruling class. Key to the new expansion was the extension of credit to workers to compensate for the declining wages and benefits. American workers maintained their living standards by going into debt on credit cards and borrowing against their houses. This debt-based spending provided the world with a market for its products. Through these measures, the United States brought about a “second golden age” of capitalist expansion from 1983 to 2007. Of course, they note, the neoliberal boom was punctuated by domestic and international financial crises. But none of these, Panitch and Gindin argue, undermined the US empire’s ceaseless drive to consolidate global capitalism. They show how the United States coordinated its dominance over the system by proving to be the only state capable of managing and overcoming these crises. In fact, the United States used each crisis to further batter down any remaining obstacles to global capitalism under its hegemony. As a result, they reject claims that the United States has been or is now in relative decline against any potential rivals. Panitch and Gindin’s book has profound insights. First and foremost, it is one of the clearest and most complete histories of US economic policy from the early twentieth century up to the current period. It is a useful companion to classic accounts of US imperialism like Sidney Lens’s The Forging of the American Empire. They put to rest the myth that globalization has sidelined the state. As they demonstrate, the United States was one of the principal forces behind globalization. It has also used international and domestic law to unleash finance capital. And, as the world was engulfed by successive financial crises, the US state in particular was central to containing them. Their analysis of the neoliberal boom also disproves claims that Marxists such as Chris Harman and Robert Brenner have made that the United States and other advanced capitalist economies never overcame the crisis of the 1970s. As Panitch and Gindin state, while “profits did not return to the stratospheric levels they had reached during the 1940s, the mass or real non-financial profits—a strong indicator of capital’s capacity to accumulate—doubled between 1983 and 1999.” And global GDP doubled in size from 1982 to 2007. Their depiction of how this boom restructured American capitalism is another major contribution. While they point to the dominance of finance, which they note garnered 44 percent of overall US profits in 2002, they do not present it as many do as a parasitical outgrowth of a weak economy engaged in speculation. Instead they show how finance capital enabled the restructuring of the American industrial base, funded research and development that allowed US capital to corner the market in high-tech manufacturing, and facilitated the development of business services in which the United States is dominant. Perhaps in their most important contribution to the debate about the shape of the current world order, they correct the misconception that the United States suffered imperial decline in the 1970s and never recovered. In fact, the US reasserted its imperial dominance over the system, achieving at least for a time after the collapse of the Russian empire the semblance of a unipolar world order. Thus, the state is not, as in the classical Marxist tradition, an expression of the underlying relations of production at the economic base of society. Instead, as Colin Barker argues, Poulantzas presents the capitalist state “in functionalist terms: it is ‘the global factor of social cohesion.’ The state, as both repressive and ideological apparatuses, holds the whole system together.”3Such functionalism, because it does not see the dynamic of class struggle as the base of the whole society, makes it very difficult to understand how society changes. The creation of global capitalism was not “an inevitable outcome of inherently expansionist economic tendencies, [but] depended on the agency of states—and of one state in particular: America.” They imbue the US state with the power not only to orchestrate its own capitalism, but the entire global system, and along with it, other states. This analysis is different from the basic case that Marx made from the Communist Manifesto through Capital. He demonstrated how the system’s competitive exploitation of wage labor for profit shapes the nature and behavior of the capitalist state. Based on this classical Marxist approach, Chris Harman suggests a far batter way to conceptualize the relation between capitals and the state as one of structural interdependence. Global empire or rival imperialisms? Panitch and Gindin reject the classical Marxist theory of imperialism pioneered by V. I. Lenin and Nikolai Bukharin. They argue that it also falls prey to the sins of economism and instrumentalism. Lenin and Bukharin contended that economic competition drives capitalist classes to use their home state to protect and enlarge their portion of the world system. Thus the capitalist system produces interimperial rivalry and war over the division and redivision of the world. Capitalist competition, they insist, does not necessarily drive capitalist states into rivalry and war. They adopt a position remarkably similar to that of the German Social Democrat, Karl Kautsky, who held the possibility that the great powers could form a “golden international” and jointly exploit the world’s working classes in concert with one another—a theory he expressed just before the outbreak of World War I. For Panitch and Gindin, this outcome has now been achieved, not by an alliance of great powers, however, but through an informal empire established by the United States. The United States emerged from World War II as the dominant imperialist power, whose hegemony was no longer expressed, as in the past, through direct colonization. It would be a mistake, however, to think that the informal US empire locks the world in a permanent peace. Because there is a structural interdependence between capitals and the capitalist state, capitalism will remain divided into separate capitalist nation-states and it will continue to produce interimperial rivalry as each jockeys for advantage in the system. There is no reason, in other words, to think that there will never be any challengers to US hegemony. As a result of what Lenin called the law of uneven development, changes in the development of world capitalism will disrupt the hierarchy between states. Established powers can atrophy and new powers can rise, generating instability and conflict within the capitalist state system. The same is true of more significant economic powers in the world system from Germany to Japan. Capitalism today remains divided, whatever the degree of its global integration, into distinct capitalist nation-states, ruled by their own capitalist classes, which project their interests and protect those interests against rivals. The neoliberal boom has given rise to new centers of capital accumulation ruled by distinct capitalist classes. The business press in a flight of neoliberal hype called them the BRICS—Brazil, Russia, India, China, and South Africa. The same dynamic is at work with the rest of the BRICS. For example, Brazil has established itself as a rising regional power. It has pursued a regional trade bloc, Mercosur, as an alternative to America’s failed attempt to expand the North American Free Trade Agreement into the rest of Latin America. It also supports the formation of the Union of South American Nations and has denounced the United States for pursuing a foreign policy it has characterized as an “exhibition of brutal force.” And it has increasingly acted aggressively in Bolivia as it attempts to direct its neighbor’s energy policy. Because the system remains divided into distinct capitalist nation-states, interimperial rivalry persists in our world today. It is not a simple repetition of either the classical period from the end of the nineteenth century or the superpower period from the end of World War II to the early 1990s. With the collapse of the Russian empire, a new period of imperialism has developed. The US remains the sole superpower, and it has significantly integrated its allies into its orbit. But far from achieving a global empire or unipolar world order, the US is the dominant power in an asymmetric multipolar world order in which it faces a host of geopolitical rivals. Panitch and Gindin are insensitive to this dynamic because they, in an ironically economistic fashion, examine US state policy almost entirely through the lens of one section of its bureaucracy—the Treasury Department. As a consequence, they fail to situate that policy within the overall grand strategy of US imperialism that includes not only economic policy, but also military intervention and international politics. The United States has been particularly concerned with Russia and China. These three states form what Gilbert Achcar calls the “strategic triad” of the post-Cold War period.13 To keep Russia in check, Washington expanded NATO into the former Soviet bloc, intervened in the Bosnian civil war, and went to war over Kosovo to assert that the United States, and not Russia, held hegemony over Eastern Europe. Since Putin’s rise to power, Russia has pushed back militarily and economically. Thus it went to war against US ally Georgia to project its power over its former republics, and recently threatened economic blockades against these republics to prevent them from entering into trade deals with Western Europe. Similarly, the United States has developed a policy toward China of simultaneous containment and engagement, which China expert Aaron Friedberg has termed “congagement” in his book Contest for Supremacy.14 On the one hand, Washington has attempted to draw China into to its free trade empire. On the other hand, it sees China as a potential rival that it must contain. In response to China’s dramatic rise, the Obama administration has increasingly tilted toward containment. There is no other way to explain his “Pivot to Asia.” Obama has initiated a free trade deal, the Trans Pacific Partnership Agreement, which is designed to exclude China and integrate much of the rest of the Asia Pacific nations into a US trade bloc. On top of that, he is repositioning American forces away from the Middle East to the Asia Pacific to deter China’s increasing imperial assertiveness. Obama’s Pivot to Asia has exacerbated regional conflicts in the Asia Pacific region as smaller powers like Japan and the Philippines attempt to gain US support for challenges to China’s assertiveness in disputes over sovereignty over islands, fisheries, shipping lanes, and undersea energy reserves. In reaction to US pressure, China and Russia have hedged their bets. They must engage with the United States because of its central role in the world economy. But, at the same time, they have established the Shanghai Cooperation Organization, which includes Central Asian states as well as America’s principal Middle Eastern antagonist, Iran, as an observer, to counterbalance US imperialism. Though China’s military spending pales compared to that of the United States, its military budget has gone through two decades of double-digit growth. The United States has not only been at odds with former Cold War antagonists, but also with its allies. For example, France famously opposed Bush’s war in Iraq, leading right-wing Republicans to rechristen one of America’s favorite fast foods, “freedom fries.” Of course, after the conquest, France and other European states signed onto the UN-approved occupation. Similarly, in the wake of the Great Recession, the United States has been unable to impose uniform economic policies. Panitch and Gindin correctly point out that Washington used the G20 to prevent protectionism from reversing globalization. But it has not been able to compel Germany to alter its export model of development or to back off its extreme austerity policies in Europe. In fact, Germany has become more assertive in its own interests in Europe against the dictates of the United States. In a further sign of the difficulties the United States faces from its rivals, disagreements between the United States, Europe, Brazil, China, and India over agricultural subsidies brought the Doha round of WTO negotiations to a screeching halt. Similarly, progress on any international agreement on climate change has been stymied as each nation-state—the United States and China in particular—tries to push the burden of curbing climate change onto their rivals. The reality of persisting interimperial rivalry helps explain the aims of US military interventions throughout the world. Panitch and Gindin argue that US military interventions have been to prevent “the closure of particular places or whole regions of the globe to capital accumulation. This was part of a larger remit of creating openings or removing barriers to capital in general, not just US capital.” They have a point here, but it is incomplete. Each of the major US wars and indeed the whole so-called “war on terror” is guided not only by a desire to keep the world “open” to capital investments, but by the project of ensuring its dominion over the world system and preventing the rise of a peer rival or alliance. The Afghan War was in large part intended to assert US power in Russia’s and China’s spheres of influence and drive a strategic wedge into the Asian landmass. The Bush administration was particularly concerned to establish military basing rights in former Soviet republics. Moreover, they wanted to assert their control over the strategic energy reserves of the Caspian Sea as well as the pipeline routes that would transmit the oil and natural gas through a network of American allied states. While the Iraq War was obviously about oil, as former Federal Reserve Chair Alan Greenspan admitted in his book The Age of Turbulence, it was not about US consumption.17 Instead the US aimed to control the spigot that supplies Europe and Asia. If that were achieved, it would give the US ability to control China, which is completely dependent on the region to meet its energy needs. The same dynamic is at work in America’s increasing intervention throughout Africa. While Washington has been bogged down in the Middle East, China has positioned itself as one of the key investors and trading partners with nations all over the continent. Thus, while the United States claims to be intervening against terrorists and to quell instability, they are also deploying their military might to ensure their control over China’s new partners from Sudan to Mali and Niger. Contrary to Panitch and Gindin’s claim that the US informal empire remains undiminished, Bush’s failed wars in Afghanistan and Iraq, combined with the economic crisis and political paralysis in Washington, have led to the relative decline of US imperial power. America’s wars in Afghanistan and Iraq ended in defeat. It is now less able to dictate politics in one of the key regions of world capitalism. It could not defend two of its key allies—the dictators in Tunisia and Egypt—against the Arab revolutions. It has been unable to impose stability in the area or in Syria, where Russia outfoxed Washington, preserving the regime of American antagonist Assad. This economic decline has been further exacerbated by political paralysis in Washington. The Republicans, beholden to the petty bourgeois Tea Party and troglodyte sections of big capital, have repeatedly brought the government to a standstill over nearly everything from the Affordable Care Act to the national budget. As a result of these triple crises, American imperialism has suffered a relative decline, allowing increased space for other powers to become increasingly assertive. Thus, the post-Cold War unipolar world order is morphing into an asymmetric multipolar one. The US remains the preeminent power, but now faces a rising potential rival in China and a host of regional competitors with their own projects and ambitions from Germany to Brazil and Russia. This asymmetric multipolar world order is not the leading rivalry of the classical or Cold War variety. There are two key reasons for this. First, the United States remains the world’s only superpower. It possesses the largest economy in the world and maintains a military arsenal, including nuclear weapons, larger than all its potential competitors combined. As long as there is no new configuration of power to replace Washington’s—something that in the past was only achieved through military conflict—its hegemonic position, though placed under great strain, will continue. Second, the complex and contradictory process of globalization tends to mitigate military conflicts or hermetically sealed spheres of influence. Capitals that are regionally and internationally invested fear the consequences of outright war on their investments. Consequently, rivalry today takes the shape of geopolitical conflict characterized more by jockeying for position against the US, not outright military conflict. But the law of uneven development and the growing schisms between the US and China in particular suggest a trajectory of reemerging interimperial rivalry. While Panitch and Gindin’s theory and history are unable to explain these dynamics, their book nonetheless possesses a wealth of insights on the neoliberal boom and its impact on the United States and world economy. It should be read, discussed, and debated as part of an attempt to develop theory and analysis for the Left’s challenge to US imperialism and the capitalist system that underlies it. I would like to flag, but not develop because of space considerations, two other objections. Panitch and Gindin’s explanation of the roots of the capitalist crises in the 1970s and today is unconvincing. Robert Brenner’s The Economics of Global Turbulence disproves their claim that the last crisis was caused by a wage squeeze. And Chris Harman proved in Explaining the Crisis that instead it was caused by a rise in the organic composition of capital producing a drop in the rate of profit. David McNally’s The Global Slump demonstrates how the current crisis was not just another example of financial volatility compounded by working class underconsumption. He convincingly proves it was actually a crisis of overproduction that has ushered in a long-term period of economic stagnation. Second, their contention that neoliberalism has incorporated the American working class is ill-equipped to explain the emerging struggle in the United States and globally against the crisis and austerity. Certainly over the last thirty years the ruling class has weakened the collective organizations of workers and the oppressed, and for a while, during the boom, finance capital offered workers a chance to pursue individual solutions through debt as an alternative to collective struggle. But in the wake of the crisis, these individual solutions are less and less available. As a result, workers and the oppressed are being driven to search for collective solutions, demonstrated by the explosive struggles from the Arab revolutions to Occupy, the Chicago teachers strike, and the Fight for 15 waged by workers from McDonald’s to Wal-Mart. In these new struggles, the challenge workers and the oppressed face is not “incorporation,” but weakened unions, atrophied social movement organizations, and a small and fragmented Left—the bitter inheritance of three decades of defeat and retreat. Louis Althusser, For Marx (London: Verso, 1986), 113. Colin Barker, “A Critique of Nicos Poulatnzas,” International Socialism, 4, Spring 1979. Chris Harman, “State and Capitalism Today,” International Socialism, II/51, (Summer, 1991), 12–13. Alan M. Rugman, The Regional Multinationals (Cambridge: Cambridge University Press, 2005), 240. Todd Gordon, Imperialist Canada (Winnepeg: Arbeiter Ring Publishing, 2010), 19. Todd Gordon, Imperialist Canada, 22. Zbigniew Brzezinski, The Grand Chessboard (New York: Basic Books, 1998), 41. Gilbert Achcar, “The Strategic Triad,” New Left Review I/228, March–April 1998. Aaron L. Friedberg, A Contest for Supremacy (New York: Norton, 2011), 88–120. Kevin Rudd, “A Maritime Balkans for the 21st Century,” Foreign Policy, January 30, 2013. Alan Greenspan, The Age of Turbulence (New York: Penguin, 2008).